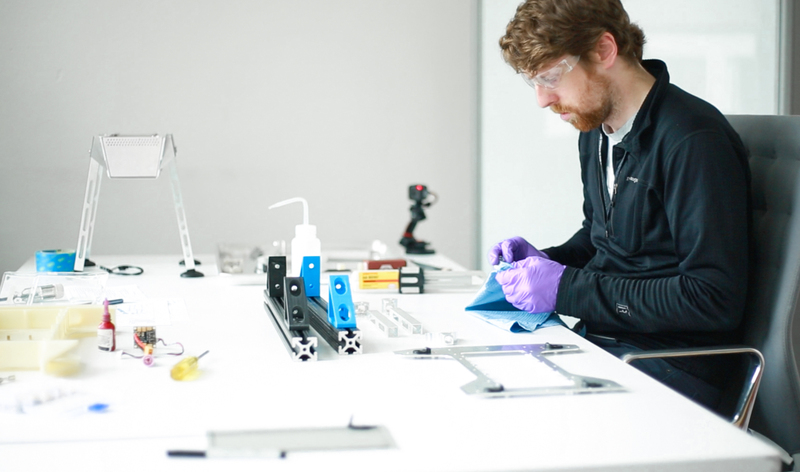 What We Learned Designing & Building An Industrial Drone. There’s no doubt: A future filled with drones roaming our skies is quickly approaching, and the agriculture, construction, and utility industries are leading the way. With the recent completion of our design and prototyping sprint for Tunnel Radio’s revolutionary SKIA industrial drone, we sat down with the team to get their thoughts on the project, and the future of UAVs. TEAGUE: You’ve worked on dozens of aviation and aerospace projects, ranging from aircraft interiors for Boeing, to the inside of space capsules, and everything in between. But SKIA was this team’s inaugural drone project. What was the biggest challenge you faced during the design and build process? Jesse Peck: For me the biggest challenge was when we made the decision to redesign the entire vehicle, rather than addressing each need piecemeal. It was clear that this was the right approach from a design perspective, but doing so meant taking on a much larger scope of work. More than that though, it meant that we would then own the vehicle. We would not be able to separate ourselves from any performance or safety issues that arose during flight tests. This felt like a huge risk, but the passion and strength of our team made me feel confident that we could deliver. TEAGUE: In what ways was the team able to push the boundaries on designing and building this drone? Erik Nilsen: The material stipulations from Tunnel Radio, which required a vehicle made from aluminum instead of splinter-able carbon fiber, was a prerequisite that set us up to push the boundaries. 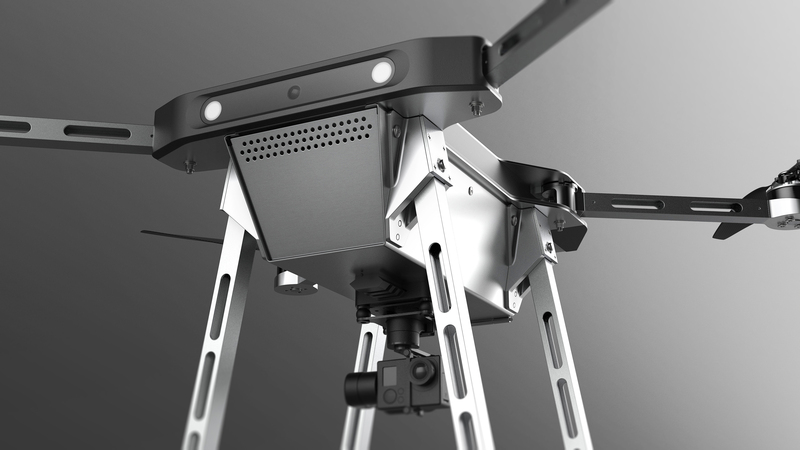 With that challenge, we were able to create a unique, industrial-grade drone unlike anything the market has seen before. In regards to timing, the toughest thing with a fast iteration build like the one we went through with SKIA is trying to meet all of your targets, both from technical and UI perspective, at the same time. We needed to make sure we were giving and getting ample, clear, and candid feedback not only from one another, but from the client. TEAGUE: As TEAGUE’s first ever UAV project, was there anything surprising or unexpected you encountered during the process? Peck: I don’t think we expected the first prototype’s electronics / avionics installation to be as time consuming as it was. Despite the fact that all of these components were supplied to us off-the-shelf from Tunnel Radio, there was a tremendous amount of hand labor needed to wire and connect everything, including the need to fabricate our own power supply busbars. This, however, did not phase the team. They dived into it, methodically addressing each problem. We ended up learning so much from this process that it was the basis of the majority of the design updates for the second prototype. The updated electronics inventory and layout is not only simpler to assemble and install, but is built from plug and play modules. This design helps to future proof the vehicle by allowing for easy updates to components and also allows Tunnel Radio to control costs by only equipping each vehicle with the modules needed for a customer’s specific mission. TEAGUE: What are you most proud of about the final SKIA prototype? Nilsen: Probably how easy it is to assemble. We were building a solution for an industry where drone use is in its infancy, and many drones on the market are complicated to put together, use properly, and repair. Our final design of SKIA intuitively snaps together just how you’d expect it to; you don’t need a huge manual to figure it out. As for capability, SKIA is really interesting, because it’s the only platform with advanced secure communication abilities. It can access relay towers for information, carry sensors and thermal imagery. But my favorite part would have to be how abuse-tolerant SKIA is. It can be used as a stepping stool, you could drop it off the back of a truck, and nothing would happen. With a conventional UAV, they break quite easily. If you dropped one made of carbon fiber from a few feet, you’d have to repair or replace it. With SKIA, you can literally bend it back into shape, and successfully complete your mission. It’s truly rugged, and perfect for industrial use. TEAGUE: Speaking of industrial use, drone utilization is definitely on the rise across numerous sectors such as agriculture, mining, and utilities. Why do you think UAVs are so critical to the future of these industries? Warren Schramm: Unmanned aerial vehicles like SKIA are important to the future of the industrial workforce because they’re the eyes and ears of the industries they serve. In agriculture, you can ask a human technician, “What’s the moisture level of the soil?” - They’ll go out and take a couple measurements in a field, and log them. If the farm is well managed the locations and probes used to collect the measurements will be standardized. Heck, you may even have an IoT enabled farm with wireless moisture probes capable of sending back measurements at consistent intervals. Drones go above and beyond (pun intended) all of that process by accessing and detecting things humans can’t. The drone logs all of its telemetry (physical location, time of day, wind speed, temperature, etc) giving the measurement context and ensuring said data is 100% usable and accurate (negating human error). This effect is amplified if cameras are used to take the measurement because the imagery can be leveraged to provide even more context and track changes over time. Since SKIA was designed with data scientist teams as the end user, this level of precision thanks to machine learning will make these industries much more efficient. TEAGUE: It’s part of our process to work hand-in-hand with our clients and partners to create products and services that they and their end users truly love. What was the best thing about working with the Tunnel Radio team? Peck: In many ways, Tunnel Radio was an ideal partner for us on this. As soon as we saw their most recent prototype and learned it was the latest in a series of models they themselves had built with scraps from their shop, we knew that we would be a good fit because “thinking through making” is exactly what TEAGUE would have done to start. The other great thing was that there was an almost immediate, mutual trust between the two teams (TEAGUE and Tunnel Radio). By the end of the first meeting, they were ready to hand over the design to us despite the fact we had never built a drone before. Similarly, we trusted their vision and previous design decisions. This trust was critical to the speed and output of the project--Tunnel Radio gave us the leeway to explore and push the design, and we quickly committed to the path without questioning or negotiating the brief we were given. The trust they showed in us also gave our team the confidence to really open up the possibilities of what SKIA could be, knowing that Tunnel Radio would support us wherever our work led. TEAGUE: What can other drone companies learn from TEAGUE’s work with SKIA? Schramm: UAV technologies change day to day, and can get really expensive to keep upgraded and up to date. When we dove into SKIA’s avionics, we wanted a solution that was modular and gave Tunnel Radio the most advantages as they entered the UAV marketplace. The flight controller that lives inside the ABS drone body is an open sourced solution, that isolates non-flight specific features like power management, telemetry/GPS inputs, and control signals to a carrier board that be easily replaced and customized. This gives Tunnel Radio the ability to design and build their own carrier board optimized for specific environments or equipment without starting from a blank sheet of paper. Leveraging and contributing to open source solutions to help future-proof a UAV design is something we would love to see other companies adopt in their product development. Peck: We spent a lot of time thinking about user interaction, and one of the insights we had was on this vehicle, most of the time we were thinking about how the controller would interact with it. How does the person who’s deploying and flying it interface with SKIA? But what this lead us to think about was, how does someone else who comes across this vehicle interact with it? In the future, drones will be delivering our packages, they’ll be cleaning our streets, they’ll be doing tasks we haven't even thought of yet. There’s the unexpected moment when you in your daily routine will come across a drone, and the question that arises is, how do you interact with it? How do you treat this autonomous vehicle? Do you interact with it as if it was another person? What do you expect from that drone? These are all really interesting questions that we can’t wait to start thinking about during our next project. Nilsen: There’s a lot to be learned from SKIA simply by looking at it, but I think the most important lessons actually lie under the hood. Ensuring the right sized infrastructure, how the vehicle deals with crashes, the payloads it can handle, all the way down to the vibration characteristics of the motors. Every element and how they function together is important to consider. But I’d say the most important takeaway for other drone companies is never underestimate what can be learned through experimentation and iteration. Understanding your end user and their needs is crucial; UAVs, while growing fast, isn’t an industry that can be easily broken into. But in looking at our work on Tunnel Radio’s SKIA drone, we can safely say anything’s possible. 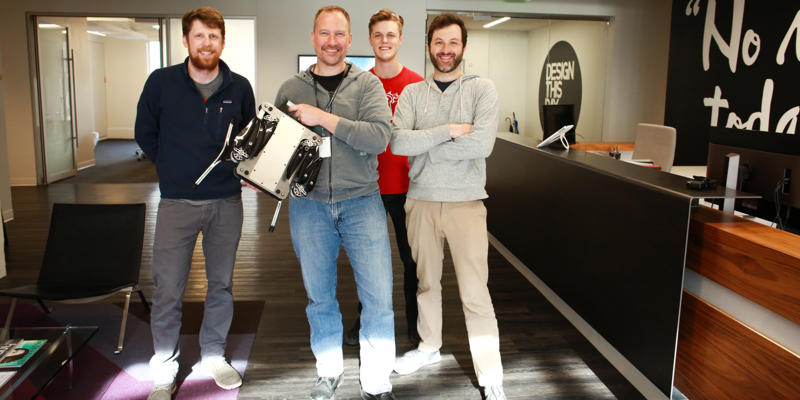 If you'd like to learn more about our work in the drone industry, or how TEAGUE can help your company tackle new challenges and take on new markets, get in touch with our team at hello@teague.com.